So often, the first thing anyone in crisis does is call 911. No response after that is possible without an Ada County Sheriff’s Office dispatcher on the other end. 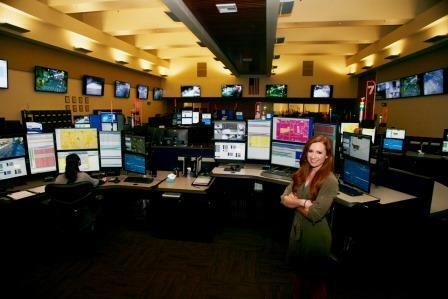 Law enforcement, fire crews, paramedics – none can exist efficiently without the communications system and support from our dispatchers, who support 12 different public safety agencies in Ada County. The Ada County Sheriff’s Office 911 Emergency Dispatch Center, located at 945 E. Pine Ave. in Meridian, handles all public calls for service and coordinates all police, fire and Emergency Medical Service (EMS) movement within Ada County. That means we take all 911 and non-emergency calls for the four law enforcement agencies, six fire departments, and paramedics who serve Ada County. We then coordinate how those agencies will respond to a call —sending the right amount of resources to the right place at the right time. We answered 118,521 911 calls in 2018, along with another 254,353 non-emergency calls for service. Most of our phone calls are answered and the issue taken care of in less than 90 seconds. Our dispatchers answer about 1100 phone calls every day and can make up to 100 outgoing calls, which include calls back to every 911 hang up. We employ 58 dispatchers and supervisors. Our dispatchers receive extensive training including CPR certification, emergency medical, police and fire training. Whether you call in to report a traffic crash with injuries, smoke coming from a neighborhood house, a violent fight, or an illegally-parked car, we are on the other end of the line. Dispatchers are trained to help people in a myriad of situations until help can arrive. They are life-savers, facilitators and directors. We are here when you need us – every second of every day. We are (208) 377-6790. We are 9-1-1. Bureau of Land Management (BLM), National Interagency Fire Center (NIFC) and the Forest Service during grass, range, and forest fires.